Last few weeks have been really hectic for me at work. Weekdays are crazy and the weekends are never enough. Early this week, I was going through our annual holiday calendar to check for the next holiday, and plan a vacation if possible. And that gave me the idea for this Excel holiday calendar template. In this tutorial, I will show you how to calculate the date of a given holiday (such as Labor Day). And you can also get an awesome Excel holiday list template (free download) at the end of this blog. It returns 02 September 2019, which is the date of labor day in 2019. This formula can easily be tweaked to get the date of holidays that fall on a given weekday of the month (such as President’s Day or Memorial Day). Since we know that Labor day is 1st Monday of September, we start with the first of September 2019. WEEKDAY function gives a number based on what day of the week it is. Since I have used 2 as the second argument, it would return 1 for Monday, 2 for Tuesday, 3 for Wednesday and so on. The above part simply subtracts the weekday number from 7 and adds 1, hence giving us the value that we should add to September 1, 2019, to get the first Monday. Below is an infographic that shows the same explanation (created using 2014 instead of 2019). In the above formula, B2 refers to the year value. The list of holidays (in the selected year). The number of days to go for the next holiday (number in the blue box). This works only for the current year. The number of days to go for the next long weekend (number in the gray box). This works only for the current year. All you need to do is select the year from the drop-down and it will automatically show you the list of holidays in the selected year. I have created this for the holidays in the US, as it occurs on fixed dates or days in a month. In India (where I live), many holidays depend on the position of the moon (and many other factors), and hence it’s difficult to come up with such a holiday template. Excel Functions used to create this holiday calendar template: –> WEEKDAY | DATE | IF. If you’re interested in learning how this holiday calendar template is created, you can unhide columns H-J in template sheet and see the formulas. You can also unhide Sheet1 where I have kept data used for the year drop-down. FREE Monthly & Yearly Excel Calendar Template. Vacation Itinerary & Packing List Template. Calendar Integrated with a To Do List Template. Thank you for the help, I would like to know how can I CREATE A SPREASHEET LIKE THIS MY SELF ? tHE EMPLOYES HAVE A DIFERETN AMOUNT OF ANUAL LEAVE HOW CAN I GET THET SHOW IN THE bALANCE ? This is really excellent task but could you please share the video of this task so that I can understand more as I have tried a lot but still unable to understand. At the end why r u substracting the (3-1) and multiply from 7 no idea. May I know how to change the row of Monday to Sunday for year 2018. Sumit – Very useful! Thank you for making the downloadable template! Quick question, how can I tweak the formulas, for say Independence Day, to show the holiday as the day before or the day after? For example, if 7/4 is a Saturday, the holiday “day off” is Friday 7/3. And if 7/4 is a Sunday, the day off is Monday 7/5. Wow this is great! Any chance you have a dashboard for Public Holidays in India? Hello Lauren.. A lot of Public holidays in India vary year on year. It makes almost impossible to get a formula that can track it. Hey Lauren.. Public holidays in India are not on fixed dates or days, so it’s almost impossible to create a formula that can return the correct date for every year. I too was searching for a holiday calendar suitable for US Federal offices (observing the 10 standard holidays) and ended up hacking together the attached version, which is printable as well. Feel free to share! Very creative little dashboard! 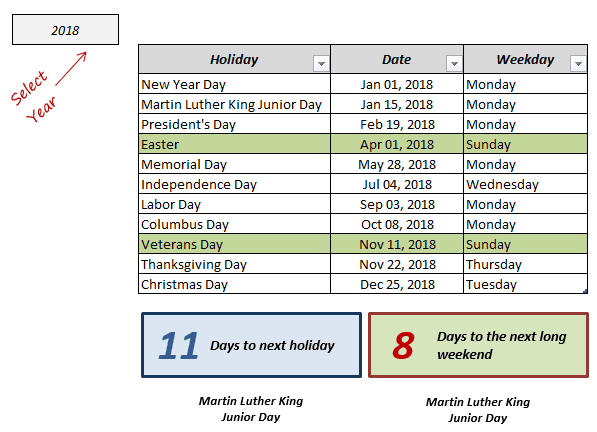 My only recommendation would be to put the data inside an Excel table so it is easy to add/subtract holidays based on the year without messing up the lookup formulas. Great job!